Last week, I presented a single-column format for menu selling on an iPhone, with the glib recommendation to let analytics determine the sort order. Today, I will expand on that. Our task is to sort the list of products in descending order of their relevance to the current deal, which includes vehicle data, consumer preferences, and financing terms. This sorting task is the same whether we are flipping through web pages or scrolling down the mobile display. The framework I present here is generalized and abstract, making the task better suited to automation, but ignoring the specific F&I knowledge we all take for granted. I’ll come back to that later. That answer will be in months or years, and the next one might be in miles, but we are going to place them all on a common scale from zero to one (I warned you this would be abstract). Think of using a slider control for each input, where the labels can be anything but the range is always 0.0 to 1.0. Next, assign four weights to each product, representing how relevant each question is for that product. The weights do not have to be zero to one, but I recommend keeping them all around the same starting magnitude, say 1 to 5. Weights can also be negative. Product Two ranks first, because of its affinity for high-scoring Question Four. Product Four takes second place, thanks to the customer’s response to Question Two – whatever that may be. By now, you may have noticed that this is the setup for machine learning. If you are blessed with “big data,” you can use it to train this system. In a machine learning context, you may have hundreds of data points. In addition to deal data and interview questions, you can use clickstream data, DMS data, contact history, driving patterns (?) and social media. If not, you will have to use your F&I savvy to set the weights, and then adjust them every thousand deals by manually running the numbers. For example, we ask “how long will you keep the car?” because we know when the OEM warranty expires. Given make, model, and ten thousand training deals, an AI will dope out this relationship on its own. We will do it by setting one year past the warranty as 0.1, two as 0.2, etc. 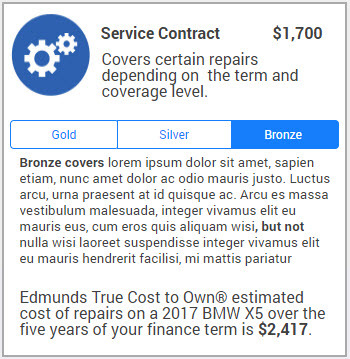 We can also set a variable indicating how complete the manufacturer’s coverage is. Same story with GAP. Give the machine a loan amount and a selling price, and it will “discover” the correlation with GAP sales. If setting the weights manually, set one for LTV and then calculate the ratio for each deal. Lease-end protection, obviously, we only want to present on a lease deal. But we don’t want it to crowd out, say, wearables. So, weight it appropriately on the other factors, but give it big negative weights for cash and finance deals. I hope this gives some clarity to the analytics approach. In a consumer context, there is no F&I manager to carefully craft a presentation, so some kind of automation is required. Followers of my Twitter feed know that I have lately been looking at mobile apps, to see if anyone can present protection products on an iPhone. I wrote about this three years ago and, according to my informal survey, the field is still open. I don’t think anybody has a good way to present a menu on a consumer web site, much less an iPhone. Not only is the iPhone a restrictive form factor but we must assume that the customer, not an F&I person, is operating it. We would like to apply our Best Practices for Menu Selling, but the app must be able to apply them on its own. For example, if we want to retain the package concept with the carefully chosen payment intervals, we can use an accordion control. I proposed this for a client once, in an F&I context, but it doesn’t make sense for consumer use. No, the best way to “present all the products, all the time,” is simply to make one long column with everything in it. The iPhone presents challenges, but there are offsetting advantages. We can show fifteen products in one column, and the customer has his leisure to scroll through them. I prefer scrolling to swiping for a few reasons. In the prototype shown here, we have the obligatory vehicle photo. After the first scroll, that’s gone and the screen space is devoted to products. The prototype shows monthly prices for the vehicle and the products. This assumes the finance process is settled, and the app can choose products matching the finance term. Touching any of the products will open up a full page with details, coverage choices, and a “sales tool” as in the earlier article. 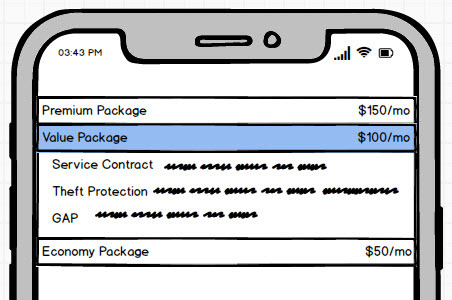 Text with graphic and price, as shown here. No price ‘til you open it. Lead with the sales tool. I discuss analytics here, but I am not a fan of the full “ownership survey.” Of the eight standard questions, maybe you can sneak in one or two elsewhere in the process. Apart from that, we’re counting on data points found in the deal itself. I also think “less is more” when confronting the customer with choices. As you can see in the mockup above, there must be no complicated grades of coverage (or deductible). If you’re configuring the app for a specific dealer, you may want to filter some options out of the dealer’s product table. Depending on who’s managing the app, the products themselves may be rethought. If you want to offer chemical, dent, key, and windshield as a combo product, then that’s a single choice. Alternatively – since we have unlimited column space – you can offer each one individually. What you do not want is a product having fifteen different combinations. Coming back to my informal survey of mobile apps, and the workflow given here, I believe there are already good examples of vehicle selection, credit application, trade valuation, and payment calculator. Menu selling has been the only missing link, until now. Feeling quantitative again today, so … suppose you have an F&I Director, or a menu trainer, or somebody, and their goal is to move product index from 1.0 to 1.2 over some time period. To keep the numbers simple, let’s say the variable comp component is $10K. One way to do this is to say that 1.2 pays $10K and the current performance, 1.0, pays zero. This makes sense, right? Why pay for no improvement? This only works, however, if you place a cap on it. As the salesman, I could come back and say, fine, if the two points of product index are worth $10K to you, what happens if I hit 1.4? Are you willing to pay me $20K for that? Most people resist the idea of capped pay plans. 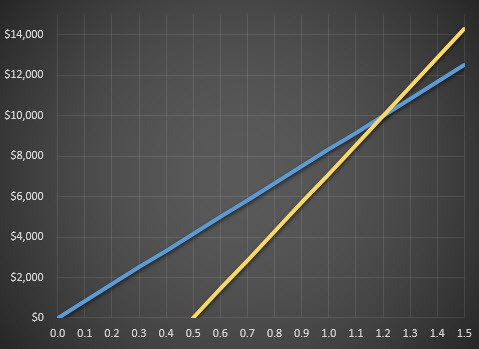 Mathematically, you are making a linear relationship between compensation and performance, and you should be willing to honor that relationship up and down the line. The problem here is that the line is too steep. So, let’s try a shallower slope. Once again, 1.2 pays $10K, but this time the zero point is 0.0. That means the current performance, 1.0, still pays $8,333 and the salesperson doesn’t go hungry unless the index actually falls all the way to 0.0. Obviously, this plan is too weak. The weak plan may be desirable if your sales force is really counting on some of that money, and the “variable” is not as variable as advertised. It also protects the company on the up side. 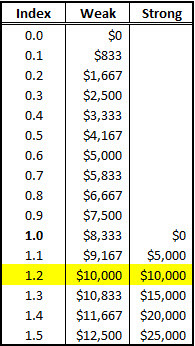 In this example, I can achieve a 1.5 index and it only earns me an extra $2,500 (on top of the $10K). Now we have examples of two pay plans, one too strong and one too weak, as in the story of The Three Bears. The key to making the pay plan just right is to observe that the zero point is arbitrary. In the papa bear case, too strong, we set the zero point at 1.0, the current performance. In the mama bear case, we set it at an index of 0.0. Now we are ready to start plotting. This time, let’s split the difference and set the zero point at 0.5. This seems to be just about right. Comp for standing still, 1.0, is $7,143; for 1.5, only $14,286, and our guy doesn’t starve until 0.5. If you have this set up in a spreadsheet, you can tweak the zero point until you have the desired amount of exposure for both parties. Below is the chart for my “goldilocks” line, with the mama bear case for comparison. We always give careful thought to the target, but sometimes neglect the slope of the payoff line. Next week, we will talk about two-dimensional pay plans, combining product index and PVR. I felt like doing something quantitative, so this week we look at seasonal adjustment factors. 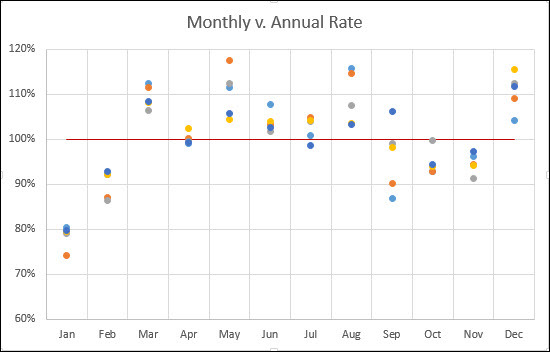 Everybody always talks about SAAR, and you probably know that it stands for “seasonally adjusted annual rate,” but what does this really mean? Well, suppose it’s March 2017, and you are wondering what total sales will be for the year. 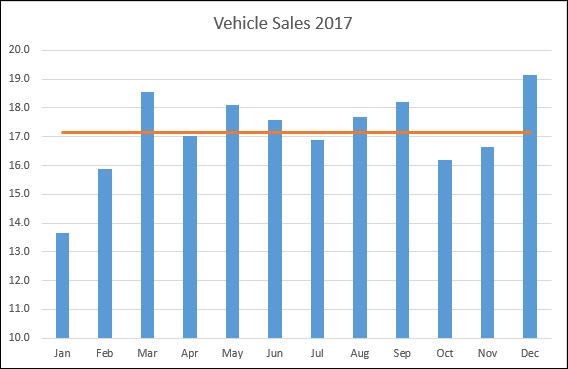 The industry sold 1.55 million vehicles that month so, if you multiply by twelve months, you might estimate 18.6 million for the year. You would be wrong, though, because March is always a strong month. Here are the estimates produced by the simple “times twelve” method, relative to the actual total for 2017, which was 17.2 million. Using data from Fred for the five years 2013 through 2017, and converting everything to a percentage, you can see how March always overestimates the year’s results. Each year’s dots are a different color, though it doesn’t really matter which is which. Some months are highly variable, like September. Not a good gauge of anything. Remember to distrust any SAAR figures published in September. April, oddly, is a tight group and bang on the annual rate. April 2018 sales were 1.4 million, so a good guess for the year is 16.8 million. Taking an average across the five years, we find that March, May, August, and December each overshoot the annual rate by roughly 10%. Finally, we convert these percentages into monthly adjustment factors. Instead of multiplying last month’s sales by 12, multiply by the monthly factor to predict the year’s total. Of course, we have more data than just a single month. We can also look at cumulative sales since January. For example, do a quarter of the year’s sales occur in the first quarter? No. It takes a while to make up for the weak January and February, and then the actual historical cumulative pace slowly comes into alignment with the idealized linear cumulative pace. I made that chart, too, but it’s not pretty. That’s enough quantitative stuff for this week.